17 Pieces from 6 Centuries Alto Saxophone and Piano Book/CD. Composed by Various. Edited by Ulrich Junk. Sheet music with CD. Woodwind Solo. 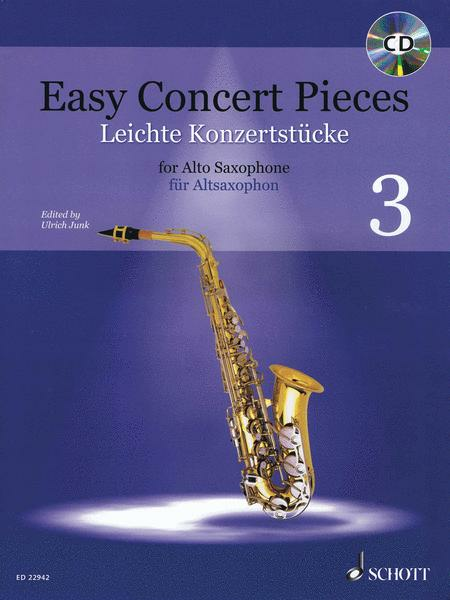 The Easy Concert Pieces series presents popular pieces for alto saxophone with piano accompaniment in progressive order. They offer varied repertoire in a broad selection of pieces from the Renaissance, Baroque, Classical, Romantic and Modern era along wi. Classical. Softcover with CD. 40 pages. Schott Music #ED22942. Published by Schott Music (HL.49046142). 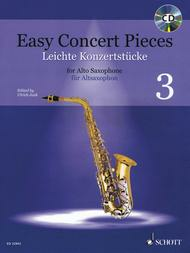 The Easy Concert Pieces series presents 3 volumes with popular pieces for alto saxophone with piano accompaniment in progressive order. These pieces are designed to complement a saxophone tuition method and are particularly suitable for performance at auditions, concerts, competitions and examinations. They offer varied repertoire in a broad selection of pieces from the Renaissance, Baroque, Classical, Romantic and Modern era along with jazz and pop. All the pieces are included on the CD in full and playback versions. Volume 3 (intermediate) uses notes ranging from c#' to F'' with a few uncommon time signatures and requiring more advanced melodic and rhythmic phrasing. It includes pieces by Ortiz, Händel, Mozart, Lefèvre, Saint-Saëns, Rubinstein, Grieg, Debussy, Ravel and others.